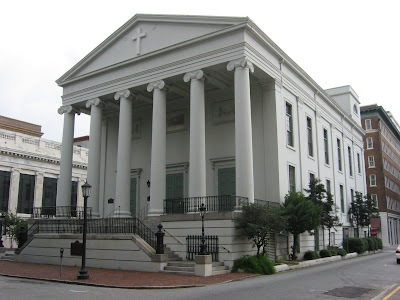 Christ Church, The Mother Church of Georgia in Savannah, has asked the Georgia Supreme Court to review a recent ruling of the Court of Appeals upholding Judge Michael Karpf’s October, 2009 decision that Christ Church holds its property in trust for the Diocese of Georgia and The Episcopal Church. The decision is based on a 1979 national church “canon”, or bylaw, which Christ Church claims (i.) cannot override its legal title to the property, and (ii) was improperly adopted. Should the ruling stand after all appeals are exhausted, then the congregation will be forced to move to other facilities. Georgia churches in similar situations could be in danger of losing their property as well. Historic Christ Church, The Mother Church of Georgia in Savannah, has lost an initial round of court decisions that stem from theological differences which triggered a debate over ownership of the church’s real estate. Although doctrinal issues are our main concern, we must address property issues as well. The Episcopal Church has claimed that because we no longer are members of that denomination, the denomination can take over all our assets. Judge Michael Karpf agrees with them. A little background will explain our position: In 1758 an act of the (British) Royal Council granted Christ Church (already in existence twenty-two years) ownership of its church building and cemetery. After the Revolution, the Georgia legislature granted a charter of incorporation to Christ Church and confirmed its ownership of all its property. Thus, since 1789 Christ Church has been a legal entity, a corporation defined, bound and protected by Georgia law whose assets cannot be unilaterally expropriated by any other group or entity (or so we thought). Christ Church has never conveyed title to its property to any other party, has never agreed to hold its property in trust for any other party, and has never received any financial help from The Episcopal Church, the Diocese of Georgia, or any other church agency. Over the last several years The Episcopal Church moved further and further away from the doctrines it traditionally shared with other Christian denominations. This has been well documented by the media, including Time Magazine, National Public Radio, New York Times, Atlanta Journal and Constitution and many others. More importantly, the actions of The Episcopal Church have fractured the 77 million member Worldwide Anglican Communion of which it is a member and elicited rebukes from other mainline denominations. Christ Church repeatedly presented its theological concerns to the leadership of our Diocese. The response given was focused primarily of the Diocese’ concern about the real estate. Diocesan leaders did not discuss with us our spiritual concerns or our desire to affirm God’s truth in the midst of the tumultuous issues before us. Christ Church disaffiliated from The Episcopal Church on September 30, 2007 by a unanimous vote of its vestry (governing board). Two weeks later this vote was affirmed by an 87% vote of the congregation. We continue to believe that we must stand firm for the Gospel and oppose the anti-biblical claims of The Episcopal Church. It is important to emphasize that this disagreement is not about real estate. It is about the basic tenets of the historic faith, proclaiming Jesus as the way, the truth and the life. Also, it is about freedom: freedom of religion, freedom to practice our religion as and where we have for over 275 years, freedom to choose to follow the Jesus of Holy Scripture and not a culturally-manufactured Jesus. We are grieved that as a result of continuing to proclaim the historic faith, Christ Church, along with over 55 churches and 4 dioceses, is being sued by a well-funded, national organization, The Episcopal Church. This organization is trying to seize the assets and church buildings in order to preach a false gospel, a way that does not proclaim Jesus as The Way, The Truth, and The Life. Instead, it twists the creeds to conform to personal needs and culls elements of Holy Scripture in support of cultural shifts that have moved far away from the true faith. Denominational churches that for any reason come into disagreement or otherwise fall out of favor with their national church organizations should be concerned about whether they can keep title to their property if this decision is allowed to stand as Georgia law. Christ Church petitioned the state Supreme Court to protect itself and stand firm against heresy. Also, we hope to alert other congregations to these issues. Again, Christ Church’s struggle with The Episcopal Church and the Diocese of Georgia has never been primarily about the property. If we had wanted to preserve the property above all else, we would have simply capitulated to the “new gospel” offered by The Episcopal Church. If we had remained quiet there would have been no threat to our building, and there would have been no media coverage, no strife, and no stress. The building that houses Christ Church is a beautiful structure and an historic icon, but it is far more than that to our congregation. It is the site where, before the founding of The Episcopal Church or the Diocese of Georgia, our forefathers proclaimed the Gospel of Jesus Christ. Today it continues as a community where the broken and lost find their hope in God, where Christians are loved, nurtured, and developed into faithful disciples, and where the Kingdom of God, His forgiveness and redemption are extended to Savannah, the southeast and the world. Episcopal Church could have very simply worshipped somewhere else. I also find it a little disingenuous for them to phrase this as "Christ Church" is appealing this ruling, as opposed to people who decided to leave the Episcopal Church but who wish to retain the property? The way these things were handled, it was not, to my knowledge ever and fair or objective process to determine to leave. Usually a popular priest and/or an inner group of vestry get a burr under their saddles about leaving and then drive the congregation ahead of them. There is very rarely a detached, open, and fair process for probing the merits and demerits of departure. Continued control of the property is used, either overtly or indirectly, as an influencing factor in driving the vote. This is particularly effective in older parishes where a lot of people feel strong ties to historic buildings. I cannot be certain that these were the dynamics at this Church, but I have seen it happen elsewhere and it would not surprise me if it were the case here. The release does not address the question of whether there is there a continuing Episcopal worshiper or worshipers who did not leave. It recites that the vote was split 87/13%. Are the 13% still using the premises for Episcopal services, or have they been forced to go elsewhere? Are they not also "Christ Church"? I thought the Court of Appeals opinion was fairly strong in its recitation of occasions on which this church had, through its history, expressly acceded to the discipline of the Episcopal Church. I know of no provision in the canons of TEC whereby a departing faction can claim property. I would be very surprised to learn that the controlling Diocese had any provision for this either. If it does, these people who are claiming Christ Church in Savannah did a very poor job of bringing that to the appellate court's attention. At a minimum, I hope that those who chose not to leave the Episcopal Church are not being inhibited in any way in continuing to worship in the premises that certainly must mean as much to them as they do to those who left. I'm starting a pool on how long before BabyBlue goes for the Liturgy of the Recitation of the Protocol (BabyBlue's version, anyway). I figured by the third sentence of the first post it was written by Scout. Scrolled down, yep. Same arguments but not grasping the concept. An existing body of believers do not choose the path TEC (or Scout) have chosen. Nor do they want to stay associated with the organization or its path. If TEC was following any of the precepts of the original foundation of the organization, it would say "Go in peace, brother." Not once has TEC acted Christ-like in any of its actions. Suing for the building doesn't win points in PR, but it's not about people, but assets and injecting fear. This popular priest theory is hilarious. If it were the only factor, millions would not have slid out of the pew and out the door across America. Some don't have the leadership to lead dissent visibly. They leave, some start new churches. But the numbers don't lie, TEC is dying, its life support is based on the generosity of those who believed in the original foundation not the new agenda. I am a lifelong member of Christ Church Anglican, and your description of the process is completely inaccurate. You make sweeping generalizations based on your personal perceptions of dynamics in older parishes, make grossly false assumptions about Christ Church based on nothing but your own opinions and prejudices, and with no personal knowledge of the facts. Hardly a basis for a credible argument. The vestry and clergy at Christ Church communicated very clearly and openly with the entire congregation on multiple occasions about both the theological reasons for departing, and a realistic assessment of the chances that we would be able to win the inevitable legal challenge and retain the property. Open meetings were held on Sundays before the 10:30 am service, as well as a series of meetings held in small groups in the homes of the parishioners. The vestry and the clergy made every possible effort to ensure that every member was fully informed about who, what, why, and the potential consequences of leaving ECUSA. The lawyers were clear that while we had clear title to the property, lawsuits are unpredictable and that we should consider the chances of ultimately prevailing as 50/50 in making our decisions. At the meeting when the vote was taken, every member of the congregation had an opportunity to speak for or against the vote. Contrary to your assertion, the process was very open and fair for probing the merits and demerits of departure. Ultimately, the congregation took a courageous stand and voted 87/13% to leave ECUSA, while clearly recognizing that we could lose the property as a result. The 13% who voted against leaving are welcome every Sunday, as are all who are seeking the truth of the Gospel. No one has been “forced” to go elsewhere. Your assertion that those who found it unacceptable to continue to worship in the Episcopal Church could simply go elsewhere is just incorrect. Christ Church Anglican is the only Anglican Church in Savannah, while there are 12 Episcopal Churches in Savannah from which to choose for anyone who disagreed with the decision of Christ Church Anglican, and who wants to attend an ECUSA affiliated Church. Some have chosen to go elsewhere, and some have chosen to claim that they represent Christ Church Episcopal. The legal analysis is too long and complex to get into here, but click on this link http://accurmudgeon.blogspot.com/2010/07/georgia-court-of-appeals-rubber-stamps.html for an excellent analysis of the errors in the court’s decision by A S Haley, otherwise known as the Anglican Curmudgeon, who is a real lawyer as well as an Episcopal Canon Lawyer. The ultimate irony is that Christ Church Anglican did not leave ECUSA to go off and do something new and different, become Zoroastrians, or Scientologists. We left in order to continue to worship and to continue the same beliefs that Christ Church has held since its founding in 1733. We left because we have profound theological disagreements with the new theology of today’s TEC. We left in order to stay in the same traditional place that Christ Church has always stood. To paraphrase President Obama, Christ Church Anglican represent no change you can believe in. Suppose TEC prevails with Christ Church as it has done with other properties. Does TEC have an exit strategy? TEC has been generally successful in gathering property, but at the same time membership is on a downward trajectory. Given that present trends will extinguish TEC as a viable denomination somewhere in the first half of this century, what will be done with the properties and trust funds? Will TEC fold itself in with the Lutherans or some other declining liturgical Church or will the remnant vote to divide up the assets and go to a rich retirement? Where do the continuing Episcopalians of Christ Church Savannah worship? Was provision made for them to continue to use the property? If not, why not? What is the principle by which a departing group of people lay claim to the physical assets of a parish when they choose to leave? BillS: are there Episcopal services at Christ Church for the people who did not leave the Episcopal Church? In the run-up to the vote, did the fora that were held to discuss the departure include officials from the Diocese? Did the clergy and vestry who had decided that their best course was to leave the Episcopal Church resign immediately upon reaching that conclusion, or did they hang around for substantial periods of time contending for others to leave? Heb 10 v 32 - But recall the former days when, after you were enlightened, you endured a hard struggle with sufferings, 33 sometimes being publicly exposed to reproach and affliction, and sometimes being partners with those so treated. 34 For you had compassion on those in prison, and you joyfully accepted the plundering of your property, since you knew that you yourselves had a better possession and an abiding one. 35 Therefore do not throw away your confidence, which has a great reward. 36 For you have need of endurance, so that when you have done the will of God you may receive what is promised.